It's finally starting to feel a little holiday-ish around here. Our trip to Hawaii in October, and the unusually mild weather this fall here in Michigan, has kept me in prolonged summer mode. A wake-up call that Thanksgiving and Christmas are rapidly approaching came in the form of an email advertisement recently: "looking for a last-minute holiday gift?" What?! I hadn't even started! But yesterday, I did do a little Christmas shopping, and enjoyed a peppermint mocha coffee at the mall. We went to see a local production of Amahl and the Night Visitors. And then, this morning, we woke up to snow. Yes, now I'm in the mood. Adding to the overall ambiance is a huge turkey stalking our suburban backyard ("the size of a small child!" my daughter exclaimed after it startled her, strutting past the basement window as she was walking on the treadmill). I'm making a favorite coffee cake to freeze for next weekend's gathering. 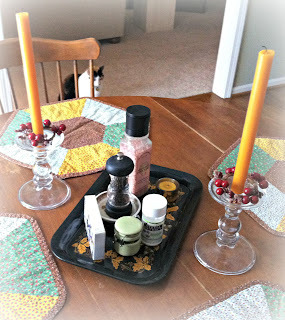 I picked up some lovely golden tapers and candlestick holders for the table. Presents are being squirreled away in hidden corners. We have six cords of wood neatly stacked, ready for loads of cozy evenings by the fire. My grandmother made these placemats for me back in the 70s. Can you tell? I love to use them in the fall. She also painted the black tray with golden leaves and acorns. the pulling out of seasonal linens and dishes (Johnson Brothers Friendly Village for Thanksgiving) . . .
Mostly, what I always hope and strive for, with varying degrees of success depending on the year, is a quiet and peaceful heart to reflect on our many blessings and to prepare space for our Lord Jesus in the midst of the busyness and excitement. In an increasingly violent and unpredictable world, it is a privilege, maybe even a duty, to offer our loved ones a haven of rest. A place to relax, feel loved, and enjoy a deep sense of security. No, it won't be perfect, but any efforts in this direction will surely not be in vain. A lovely post, Deborah! 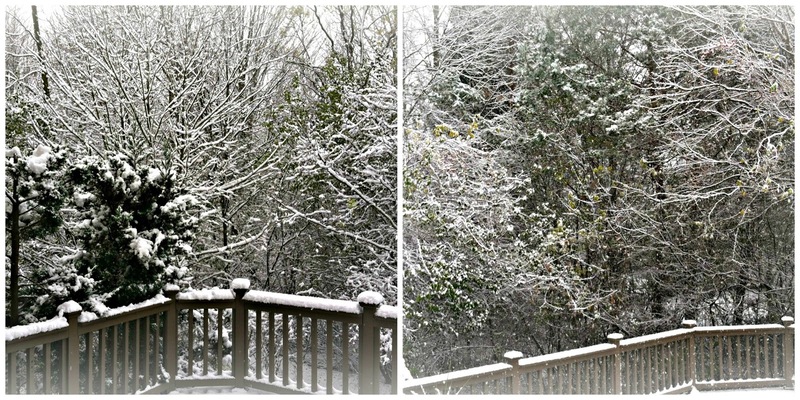 We had a sprinkle of snow a few weeks back but otherwise we've no snow. It does make a person think it's not that far along in the month, but here we are hurrying along to December. I certainly agree that it's more and more important to have our homes as a haven where loved ones can relax and receive consolation and ease of comfort. Wishing you a beautiful evening ... definitely fireplace times! Our weather is finally hitting seasonal lows with the snow starting to fly (again) today and you're right Deborah - it sure puts you in the holiday spirit! I look forward to cozy nights by the fire as well and a relaxing family gathering next month. Yup, that paragraph says it all. Oh and I do love the placemats your grandmother made for you way back in the 70s. Great, great colors! Such a beautiful post, the sentiment making our homes a haven of rest struck a chord. Happy Thanksgiving. Beautiful post Deborah. At a glance your placemats spoke "70's" to me :-) I think Thanksgiving may be a little more special to a lot of people this year as we hear and see so much chaos in our world. Light the candles, pull our family and loved ones a little closer and above all else, praise God for our many blessings. Beautiful post! Yes, those placemats look like some I was given in that era. I think it was 'the gift' to give. Last year we took a few of our grandkids to see the MN Orchestra and MN Ballet perform Amahl and the Night Visitors. I've always loved that operetta ? and try to find it being performed somewhere in the area. Also, I just purchased my first Friendly Village tea cup and saucer last year. Love that pattern! Thank you for stopping in today. Have a wonderful week ahead. Your blog is always so beautiful. Lovely post. A change in the weather does seem to "jump start" the holiday feel. I have similar placemats that my mother made. Happy Thanksgiving! This is a lovely post, Deborah. The placemats are a wonderful reminder of your loving grandmother who made them for you. I'm sure you bring them out every Autumn with a thankful heart. Since our Thanksgiving has already taken place, we are thinking about Christmas. I'm just starting to decorate and some gifts have been bought. Especially at Christmastime, I am reminded of all the blessings that have been poured out upon me. No, my life is not perfect and like any other family we have our issues. But the love we share is vibrant and strong and I am so thankful for what we have. We are especially blessed for having the freedom to worship our Lord wherever and whenever we wish. Yes, we are blessed indeed! Thank you for sharing and Happy Thanksgiving to you and your lovely family. Sure, with snow you rapidly can advance to the Christmas-mode! We seldom will see that around here but today was a very crisp day, sunny though, as we drove to Atlanta for our regular rounds at Trader Joe's, Whole Foods and Costco. Frost tonight... so it feels nice and cozy inside and yes, I'm all with you for providing that safe haven for family and loved ones. That is THE most important thing in our lives. All other commercial things can be replaced and bought again but the LOVE that we give and the cultural tradition that we try to keep alive and pass on is far more important. Blessings to you and stay warm! Your snow looks lovely! I think your placemats are perfect. I keep things for years and years and then they are so sentimental I have to keep keeping them! I loved seeing the placemats that your grandmother made, Deborah, and also the painted tray. Seeing the snow was fun, too! It was a gorgeous day in Ohio today and so nice being with my mom. Yes, you're so right, it's important to keep our homes a safe, cozy haven for our families. May you and your family have a Happy Thanksgiving, sweet friend. I have so missed you and your beautiful blog while being on my break - it's so good to be back. Your posts always inspire me....actually you inspire me - you are such a beautiful and encouraging lady. May you and yours have a blessed Thanksgiving. I am so ever so thankful for YOU! Much love! Thank you for this lovely post. Those placemats from your grandmother are so special! That last paragraph really resonated with me, too. You are so, so right about this! You have put into words, beautifully, thoughts that I think every day. I love your placemats, too. What a talented lady your grandmother must have been! I tend to give a lot of handmade gifts, and that's part of the reason. After I'm gone, I love the idea that my grandchildren will have something tangible to perhaps bring out seasonally and remember me by. An all-around lovely post. Thanks for sharing.